Peak Oil is referred to as the maximum level of oil production – notionally of the world – that is expected (or passed). There has been much talk of Peak Oil over the years – however, the world seems able to produce ever increasing quantities of liquid oil as new technology and method develop to extract oil – for the time being at least. Decline: When you look at each country individually though, many countries have passed Peak Oil and are on a permanent declining oil production like Norway, Denmark and the UK. For these countries, the chance of each nation surpassing their previous peak is probably less than 5% - it’s almost certain they are passed their peak. Peak Cheap Oil: The important point to make is that despite oil prices rising tenfold from 1999 ($10/bbl) to 2013 ($100/bbl) oil production has only risen 20%. This also means that there has been a peak of cheap oil or “Peak Cheap Oil”. If you take out the new oil production that costs >$65/bbl to produce, it’s likely there would not have been any rise in oil production over 1999 levels. We seem to be on an undulating though slightly increasing plateau as new expensive oil is able to keep up with the growth in demand from developing nations, the increasing global population whilst demand from developed nations continues to decline. It’s the combination of new technologies and production techniques such as deep long multiple fracced horizontal wells and highly energy intensive oil sands production that has helped the world keep away from overall global Peak Oil. If you cut the prices of oil to $30/bbl, we would definitely be in production decline and have suffered the “Peak Oil” event. But the more important point for individual countries are whether they have respectively reached Peak Oil for that nation or not. Because having oil production and oil exports gives a big economic boost, though when this is taken away, the countries that was used to cheap oil all of a sudden has to import oil - they suffer from a “Peak Oil shock” or crisis. In a way this is quite predictable. The balance of payments deficit increases, import costs sky-rocket, fuel subsidies need to be stopped, inflation rises, food prices rise, currency values decline and the economy suffers contraction and stress. Then the population gets stressed, often angry and sometimes then get violent and/or demonstrate – especially if food and fuel prices rocket higher. 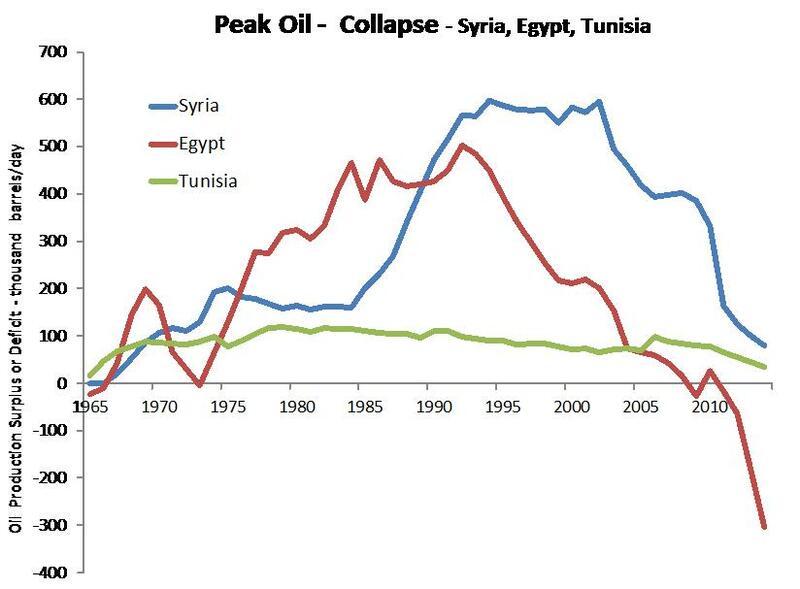 These are all the effects of Peak Oil on a country. Let’s look at some examples – of which there are many. Libya – just before Col. Gaddafi was deposed, the country was producing 1.6 million bbls/day at a steady rate – Libya now produces 0.25 million bbl/day after oil port strikes, security problems and insurgents shutting pipeline demanding payments etc. The economy has spiralled into miserable a depression as oil revenues have dried up. A key theme is that all these countries have been reliance on cheap oil and oil exports to help their struggling economies – the government and populations probably got used to their own cheap oil – then it started to run out and their economies were not robust enough to cope. Particularly as these countries are hot, have water crises and much of their food needs importing. Getting fat on cheap oil then having this taken away has been a disaster – probably worse than having it in the first place. One reason why we say this is that countries like Jordan have no oil or gas, but have remained remarkably stable during this same period. Peak Cheap Oil - sent oil prices rising from $9/bbl in 1999 to $148/bbl in July 2007 - causing oil shock and economic decline in PIGS countries - with ensuing collapse in oil consumption as depression set in. These countries all joined the Euro and got an easy ride from the strong Euro with low interest rates from 1999 through to 2007 – but when oil prices skyrocketed to $148/bbl in 2007 – it tipped these countries over the edge in part because their manufacturing and financial services industries were so weak or small. Their economies could not cope. 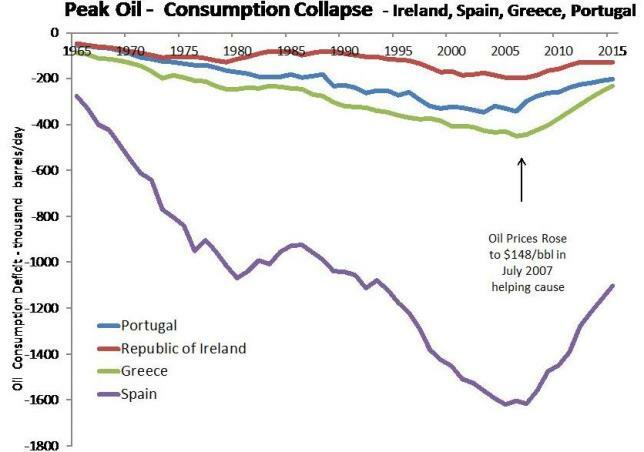 At $100/bbl Greece’s finances are unsustainable – Ireland is recovering and once their new gas production comes on stream late 2013from Corib this should help boost their small economy. Spain is still struggling – with oil at $100/bbl and gas import prices linked to the oil price, this will act as a significant drag on their economy. What have these countries all got in common? They had wealth through either oil or cheap Euro financing-loans, and then this was taken away – leading to a downward spiral. They also suffer from aging populations and an unsustainable or non-existent welfare state. London Boom: The richest most mobile people in these countries will take their money out of the country and move to places like London – this causes further economic misery and depression. This is one reason why West London property prices have risen sharply. 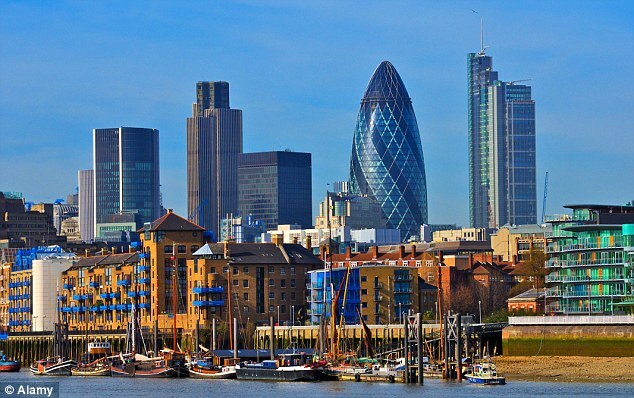 As countries have struggled – the super-rich have bailed out – and put their money into London property which is widely considered as a safe haven. London property has excellent legal rights, reasonable taxes and is an open market for overseas cash buyers. Other places to benefit are Monaco, Luxemburg, Switzerland and Malta – all tax and safe havens. North Sea Decline: The UK’s oil and gas production has crashed since 1999 – both Labour and the Tory Coalition have put up North Sea taxes three times precipitating a collapse of production and exploration drilling. In the 12 months from the last rise in March 2011, production of both oil and gas collapsed 23% and has not recovered – it’s still declining at a rate of 15% a year. So the UK is another country that used to be flush with oil revenues that will struggle in future years – because it built a public sector based on these oil revenues and it now cannot afford these services. As long as London can maintain its global city status, it stands a chance of attracting foreign investment that can boost property prices, but don’t be surprized if UK Sterling bond rates rise sharply as the deficit remains under severe pressure and government borrowing stays very high – some $120 Billion a year predicted form 2013. This will lead to further Sterling decline and higher inflation. For the areas far from London, either recession or outright depression will continue as an aging population, low fertility rates and younger wealth people either returning in the south or moving to London for work will all work against the local economies. Manufacturing: in the UK was destroyed years ago and shows no sign of gaining significant ground – there is not enough investment, innovation or engineering prowess to compete with the Germans and other emerging manufacturing centres like China. Manufacturing now only accounts of 11% of the UK economy – a shadow of its former self. So areas in the north and Midlands will feel the pressure as factories continue to close and the bloated public sector is cut-back with the UK running deficits of 8% - unsustainable levels – particularly as oil revenues decline.